IoT devices are vulnerable to security hacks, while transmiting confidential and sensitive information. Low-cost microcontrollers used require a very secure connection. Make sure your IoT devices are protected, secure all connections in your car, enable security on high speed data centers links, encrypt data in transit on 5G networks. Lack of standardization and regulation, interoperability, cost of implementation are the major issues to IoT adoption …However, data privacy and security are the most important barriers to overcome. As an IoT player, you are looking for security solutions that are easy to use and implement because of limited budgets for IoT security. Certainly the demand for IoT security products is dependent on IoT market adoption, but significant needs are already here for many vertical applications and government requirements. Today, multiple security technologies can efficiently reinforce devices or applications, mitigating security concerns. 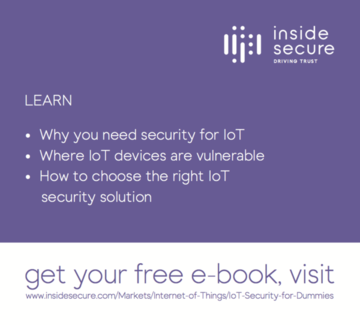 However integrated software security is the most critical consideration for the future of IoT. Being proactive about building security into a solution at an early stage of the design process is critical for the success of IoT. Inside Secure is at the heart of it! 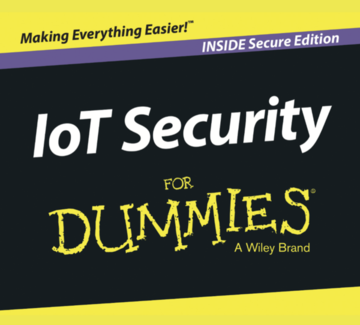 "Our wide range of security solutions for your IoT security needs"